The lateral fines removal drum allows continuous washing with GEWA Plus machines, without ever blocking the filters on top of the pump tank – even on foamy products and products with high quantity of fines. The fines drum has a 0.5 mm opening wedge wire and filters circulating washwater, protecting the GEWA water pumps from particles. Water flows through the filter drum back to the pump tank. A scraper removes all retained particles from the drums filter surface. 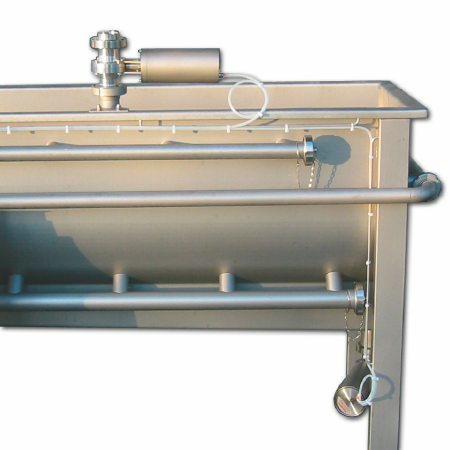 This fines drum can be easily tilted over and taken out completely from its fixtures to allow cleaning. The device is driven by the same type of motor used on the insect removal drum, which simplifies spare parts inventory. 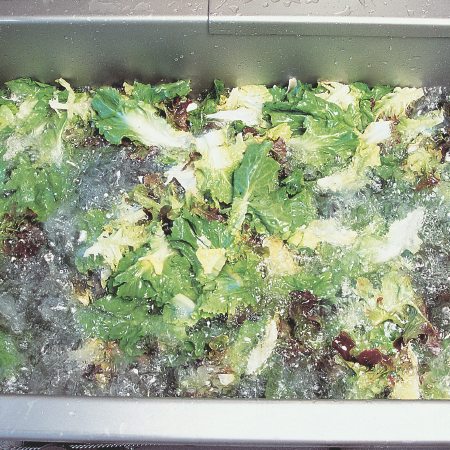 The new sand trap funnel is a worthwile addition to the GEWA PLUS washing machines for washing sandy produces like lamb’s lettuce and also sprouts (separation of non-germinated seeds). Extremely sandy and dirty products will be washed gently and efficiently. The sand trap funnel is able to absorb 49 l of the sand / water mixture. 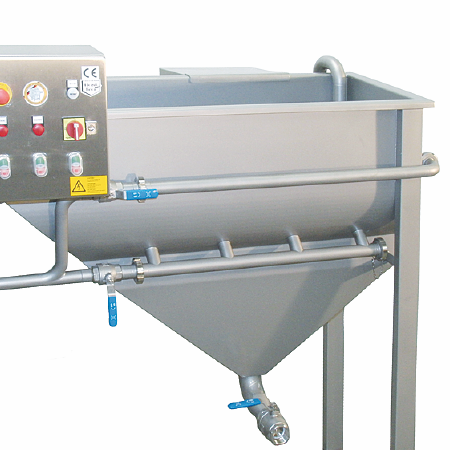 The sand trap funnel can be discharged either by the manual opening of a ball valve or can be discharged automatically by means of a pneumatic valve in combination with the WMS (water management system). Settings such as cycle of opening, opening period, etc. can be done at the switch box, thus an automatic and regular discharge takes place. 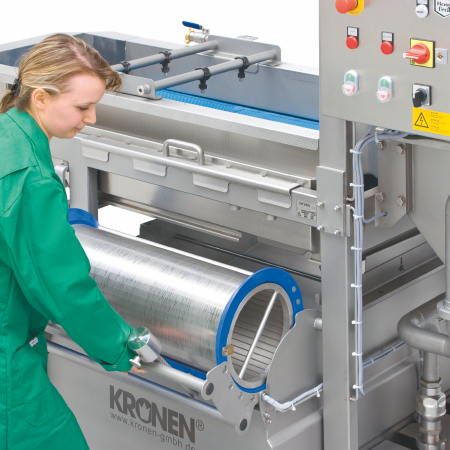 The KRONEN air system allows taking advantage of the HELICAL washing system in combination with the advantages of the floatation washing systems. Air is blown through pipes with multiple perforations which can easily be installed anytime into the wash tank, creating air bubbles in the water. This combination of minimum water flow intensity and the air bubbles system leads to better overall washing quality and product care. Specially when used for delicate products, such as whole leaves or some difficult products as parsley, Lollo type lettuce and baby leaves. 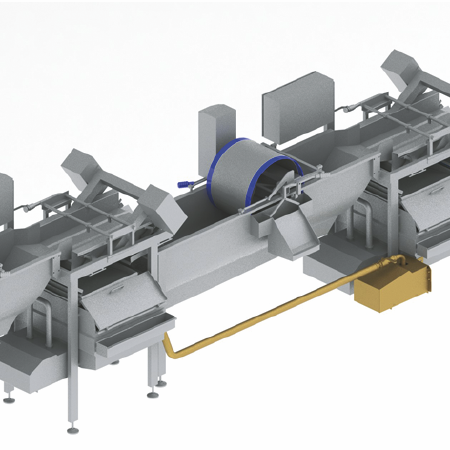 KRONEN water recycling system is used on washing lines consisting of at least two machines. Excess water coming from the second washing machine is brought back to the first washing machine, reducing significantly the overall water consumption. We do this, knowing the fact that the first tank has generally bigger concentration of dirt and germs than the second tank, enabling fresh water entering only at the second machine, renewing the whole water cycle from there.